Her blog has always been a big source of inspiration for me! Today I as always I visited her blog and guess what??!!! Many many thanks Holly! It's an honor for me! Oh honey one look at your snails and I couldn't stop my fingers from typing a post about you. Lovely!!! 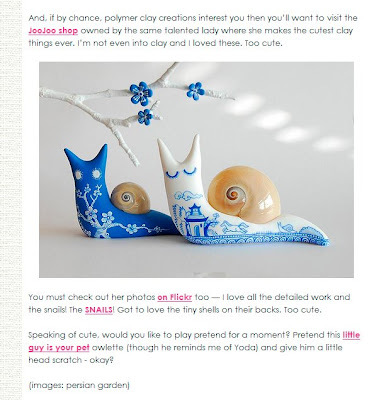 Great feature for you JooJoo and I love those blue snails....every time I see your work, it makes me smile. Great job. Congrats!! Your work deserve it! Wishing you a lot of success, Afi! I just discovered your lovely craft at alona lahav blog! and I am so happy to meet you! 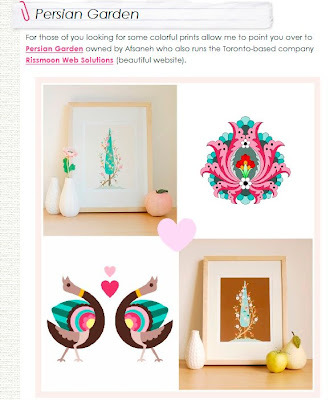 Congrats on features at decor8!!!!! and the new snails are ADORABLE!!!!!!!!! Congrats!! You deserve it! Wishing you a greater success, Afi! Yes, yes, yes, congratulations! All your artwork is incredible and brings me such delight! Yay! Congratz!! Your work is always soo beautiful! Hope you had a good weekend and love to yoU! Wow! I love these little snails! How pretty, what detail!